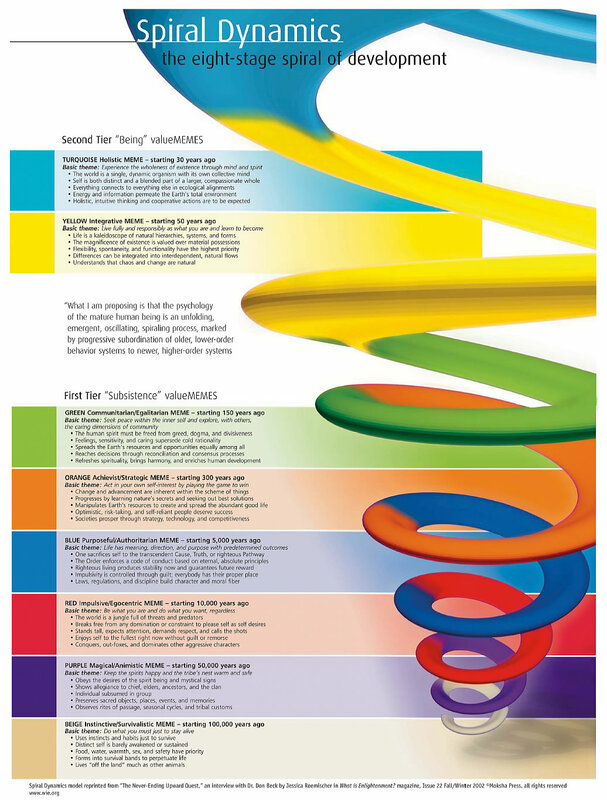 Today I officially started kicking off my research into Spiral Dynamics. I’ve had some superficial knowledge of the subject due to my exposure to a number of books on Integral philosophy. I recently came across the original book on Spiral Dynamics by Beck and Cowan and thought this would be a good place to start. 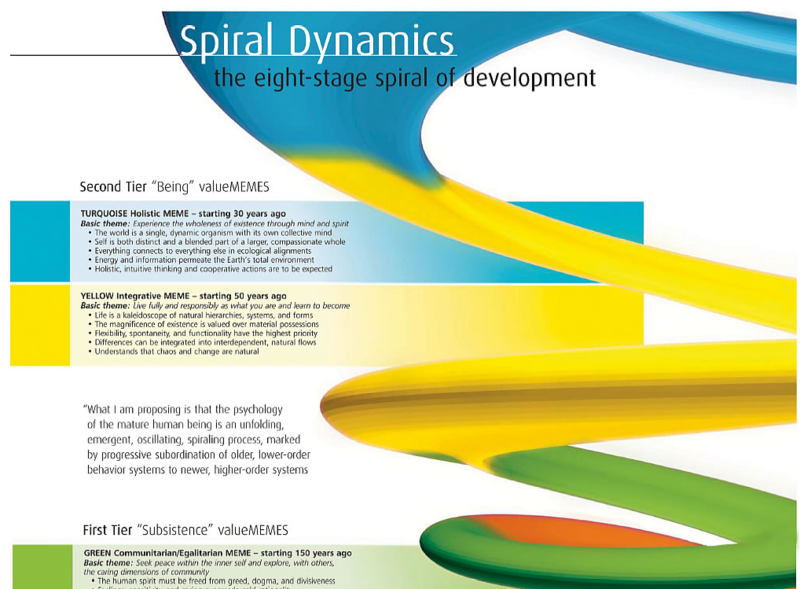 I also remembered seeing a link to a mindmap on Spiral Dynamics a couple years ago and decided to hunt it down before I immersed myself too far into the book. I found the original link via a Google search, but unfortunately discovered that the original site is no longer up (http://www.integralsingularity.com/freemindbrowser.html). Thanks to the WayBackMachine (archive.org) I was able to salvage the map. I was going to upload and view through my Mind Map Viewer, however FreeMind’s flash viewer was having problems rendering it (possibly due to the size?). At any rate, I figured I would salvage this great bit of research and host somewhere so others could benefit (full credit goes to the original author). I’ve uploaded the map to my site(SWF/Flash format from MindManager), and provided some links to the map in other formats (FreeMind,Mind Manager,PDF, and HTML outline). Thanks for doing all that work Eric – three gold stars and a smiley stamp :). I’ve updated the link on Integral Diagrams for Mind Map of Spiral Dynamics (under Other diagrams:) to this blog post. Thanks Stephen 😉 Stay tuned, I’m sure there will be more maps to come. Thanks for putting this up. I myself have been looking for it ever since it’s old site went down. Hmm, the PDF link is a single white page. The PDF works fine for me on my Mac. What operating system are you using? I’ll give it a try on Linux and Windows as well. Very strange. It does work on Linux and Mac, but not on Windows XP SP3 using the latest version of Adobe. I re-exported the PDF using MindManager and verified it works now. Like all “tools” or “maps” it’s not the end all but it is a hell of a powerful reference tool and filter through which to view the world–preferably with one eye. I cant’ tell you how often I reference SD for perspective and compassion. I couldn’t make your MindMap plug-in work on Chrome, despite downloading various ‘readers’ until I changed browsers to FIREFOX (on my Mac) and it instantly unfolded when I clicked your link. Maybe you’ve mentioned that, but I didn’t see it.